I like to say that London is one of the worlds best chocolate cities and in the last few weeks it got a little bit sweetwer, with two new openings of note. Firstly I want to tell you about one of my favourites, a bakery I will, and have on multiple occasions, travelled to for their wonderful pastries and breads but also a place that makes and sells world class chocolate, Pump St Bakery. This is a family run affair, set up by Chris and Joanne Brennan, a father and daughter duo. Chris, an avid home baker, retired and took his hobby full time. First came the bread, then the pastries and then maybe even more excitingly came the chocolate. Considering the quality of the chocolate they make you might be a little surprised to find that they are based in the sleepy village of Orford. A beautiful picturesque English village it something you might see when watching a period drama not what springs to mind when you think chocolate. In their factory hidden away just outside the edges of the village however, lies their bakery and chocolate production facility where they have been quietly producing chocolate since 2012. I say quietly but in reality they have been making some serious waves, the chocolate is available all over the world and I have seen in places as far and wides as New York and Tokyo. For the last few years they have been putting out what I consider to be some of the best chocolate in the world. They source beans direct from the farmers, helping support sustainable cocoa production and turn those into an amazing array of chocolates. But back to the bustle of London. Pump St’s bakery is not exactly a quick jaunt from London and whilst you can buy their chocolate from many places in the city you cannot get the full range easily and you definitely cannot get their wonderful baking so for the second time, the last time being 3 years ago, the bakery has popped up in Shoreditch. They have taken over the In House space, a dolls house sized shop located on Redchurch St in Shoreditch. The important things to note are that a) this is a short term pop-up they are only here until Sunday and b) if the previous incarnation is anything to go by get there early to avoid disappointment, the baking sells out fast! There’s probably a good chance you’ll spot me there all week, I am a huge fan of their eccles cake. I would go so far as to say it is the best I’ve ever had and trust me with the amount of eccles cakes I’ve had I must qualify as some sort of self proclaimed eccles cake expert and definite willing quality assurance officer. Besides the daily deliveries of fresh baked goods there is also plenty of chocolate goodies to stock up on. 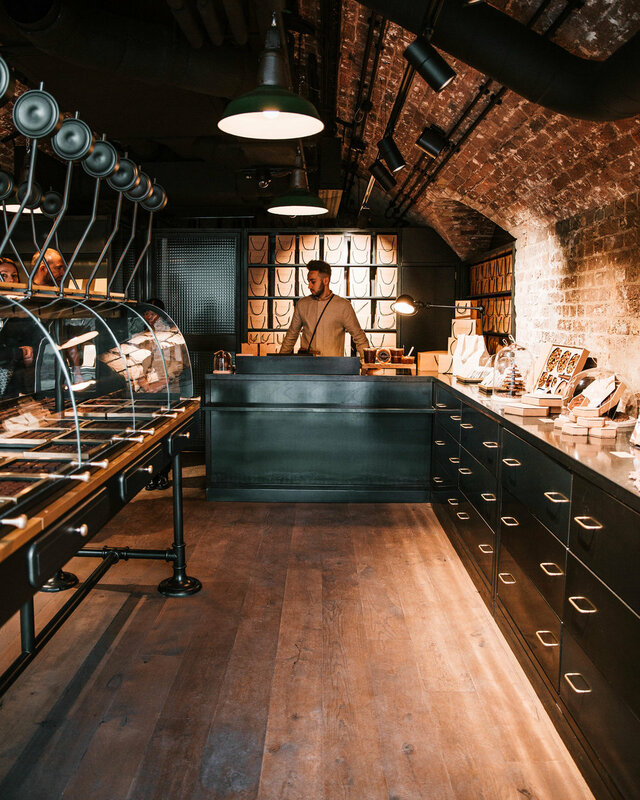 They sell an amazing and intriguing variety of bars, everything from single origin dark and milk bars to coffee infused varieties (in partnership with Workshop Coffee) to the very special bakery series that marries the two sides of their business. Think dark chocolate with the addition of sourdough and sea salt or a milk chocolate that is infused with crumbs of rye bread or the newest in the line up, a delicious panettone bar. At the pop-up they are also launching their first ever cocoa powder which to me seems like a massive feat for a comparatively small company. The cocoa powder is a natural variety, as apposed to dutched, but it’s not your everyday natural cocoa powder. When a cocoa is ‘dutched’ it is washed in a potassium carbonate solution that removes a lot of the acidity present in cocoa and darkens the colour. Pump St wanted to avoid this process so they conch the cocoa nibs before pressing it into powder which naturally removes a lot of the acidic notes creating a cocoa powder that is seemingly a halfway house between traditional natural cocoa powders and dutched versions. I for one am very excited to bake with this and see what the difference is. The second chocolate opening of recent weeks is Le Chocolat by Alain Ducasse. 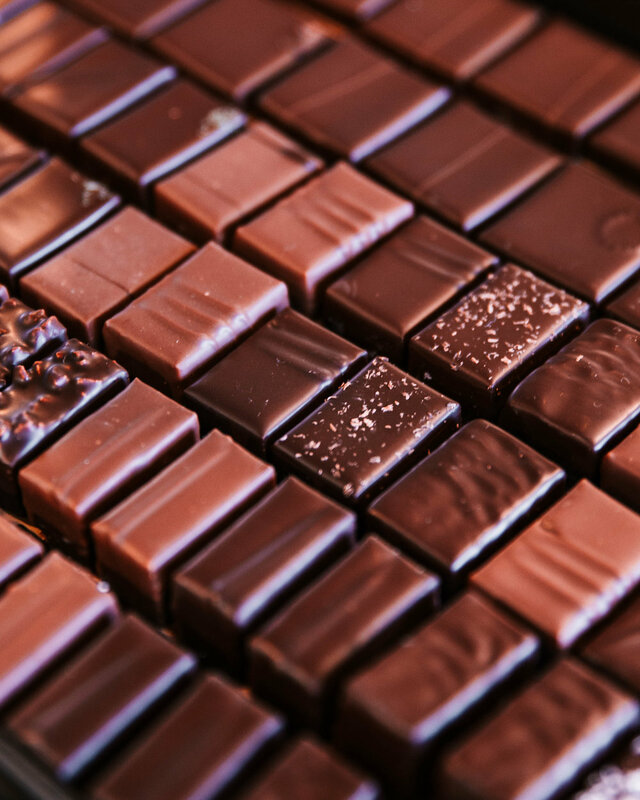 Based out of Paris the famed Chef, Alain Ducasse, set up his chocolate business back in 2013 with the aim of creating chocolate from bear to bar that he could use across his many restaurants around the world, of which there is currently around 30. The original shop is housed in an old Citroen garage in the Bastille neighbourhood, in the 11th Arrondissement of Paris and it is a wondrous, beautifully designed space. They took a rough and ready space that had been neglected for many years and transformed it into a gown up, sophisticated chocolate haven. As with many chocolate companies, finding the equipment to make chocolate was a little tricky so in the kitchens you will find a variety of repurposed machines, equipment originally intended for roasting coffee, grinding mustard seeds, or even making paper, now used to create chocolate. As with Pump St, Le Chocolat is a bean to bar producer meaning they buy beans and process that into chocolate. One of the differences is that whilst Le Chocolat also makes chocolate in its bar form they also make enrobed chocolates and pralines. The pralines also happen to be my favourite thing they make. They make traditional almond and hazelnut versions but also more modern peanut and coconut varieties too. Whilst the company has been around since 2013 and recently expanded into Japan until recently their only footprint in Europe was the handful of shops that exist in Paris. A couple weeks ago this changed when they jumped across the pond and opened in London, in the new fashionable Coal Drops Yard, a beautiful shopping and restaurant district just north of Kings Cross Station. The development has taken an 1850’s coal storage yard which then became a haunt for ravers in the 90’s and turned it into a shoppers delight. They have kept much of the architectural features and very successfully redesigned the space for a modern purpose. The aesthetic suits Le Chocolat perfectly as it’s all bare brick and industrial elements, exactly as you would find in the original Paris location. In Paris not only did they incorporate old machinery they used a lot of vintage finds to outfit the retail store including many elements from an old Parisian bank. If you are looking for something a little different Christmas they also have a nice range of edible Christmas decorations, from a build yourself Christmas tree to a massive Christmas slab that comes complete with its own mallet. Plus if you feel a little old for a Cadburys advent calendar they also make their own spin on the idea. They will also, in the not too distant future, be opening a cafe next door that has a similar mission to Le Chocolat, a cafe serving coffee sourced and roasted for use within the Ducasse restaurant group.